The holidays are the one time of the year when I love making fudge and have it on hand all the time. I love it all year round, but my waist line won’t let me keep in handy. Or rather, I have no self control when it comes to fudge. ..hanging head in shame! 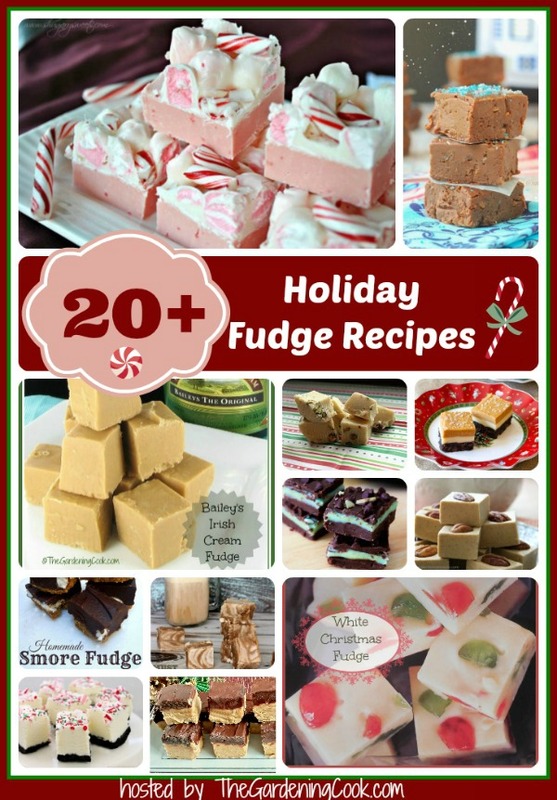 This round up features 23 of my Favorite Holiday Fudge Recipes. Some are my own recipes and others have been submitted by blogger friends of mine. To see any of the recipes, just click on the link near the photo or the photo itself, to go directly to the recipe page. Thanks to all the bloggers who shared recipes! 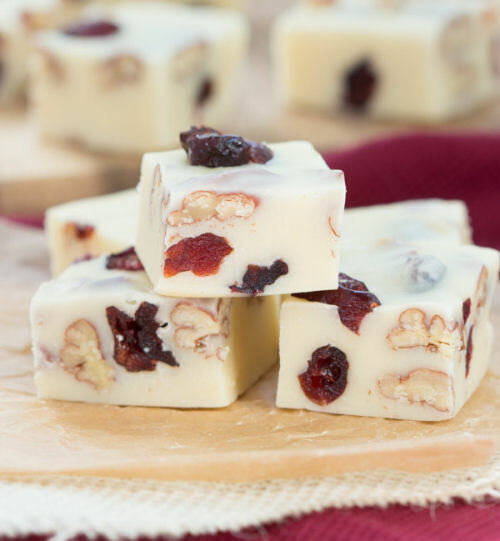 White Chocolate Cranberry Fudge. Cranberries are out in force this time of the year. Why not use them the way Ashley does on Spoonful of Flavor? 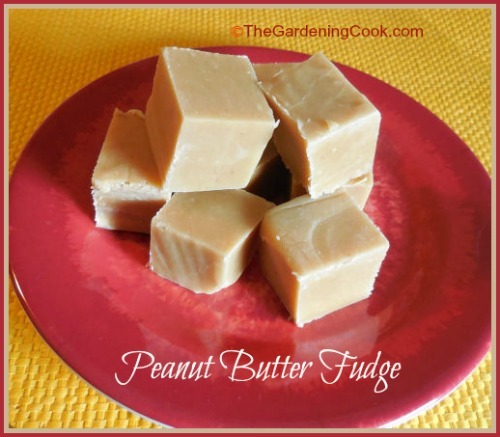 Easy peanut Butter Fudge. 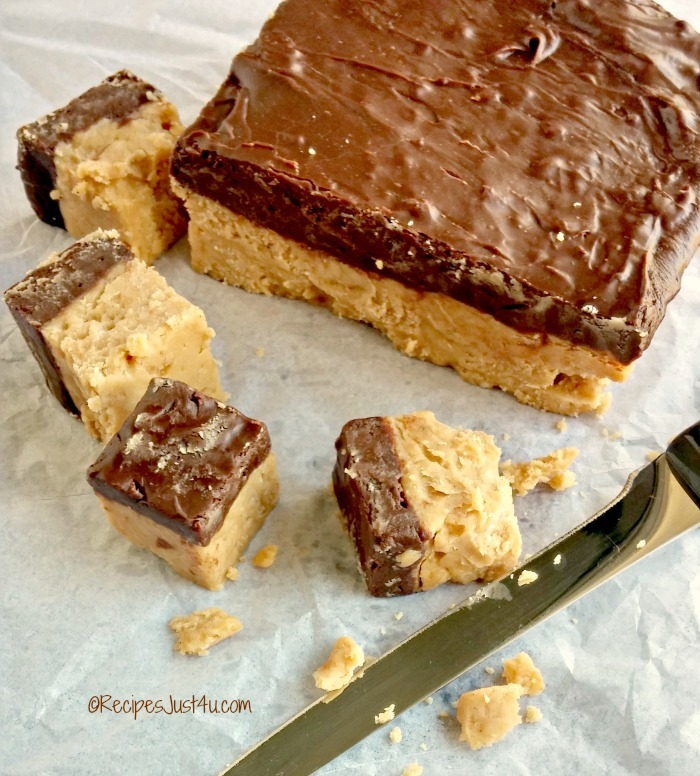 Topping my favorite list is my recipe for easy peanut butter fudge. I make it with smooth peanut butter, but you can add nuts or use a crunchy peanut butter too. I love this recipe because it is fool proof. The marshmallow cream makes it a nice light color too! click here for the recipe. 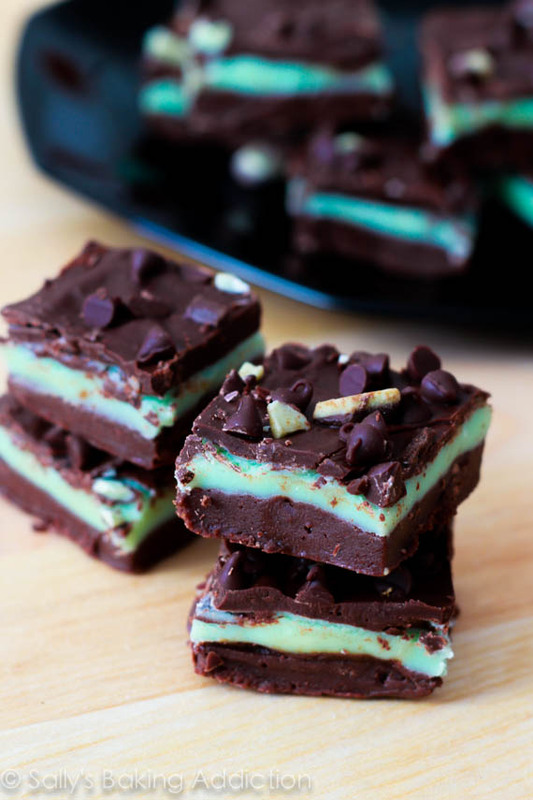 MInt Chocolate Chip Fudge. Mmm Mmm all my favorite tastes in one. 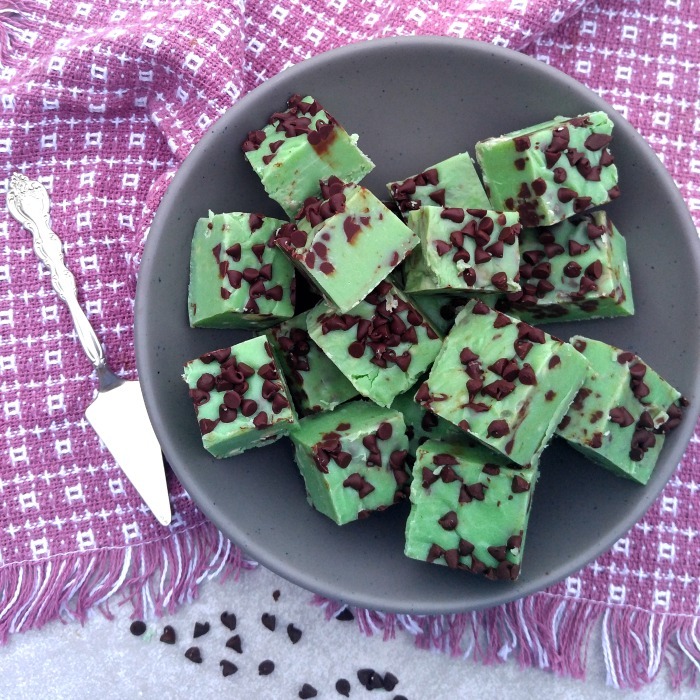 This Mint chocolate chip fudge has a fabulous taste and is so easy to make. Get the recipe here. Buckeye Fudge. What should you do when you can’t decide between chocolate fudge and peanut butter fudge? 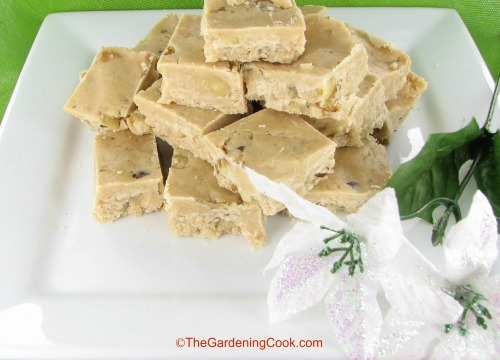 Make this buckeye fudge from Recipes Just 4U. It has a layer of both and looks delicious! 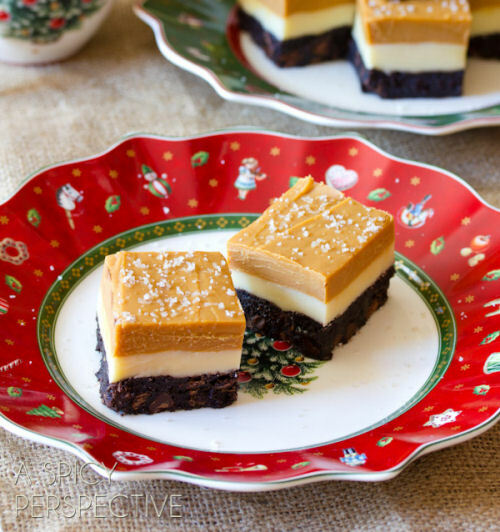 Salted Caramel Eggnog Fudge Brownies. Who doesn’t love a dash of eggnog for the holidays? This recipe is a combination between a brownie and a piece of fudge. Get the recipe on A Spicy Perspective. Rocky Road Fudge. 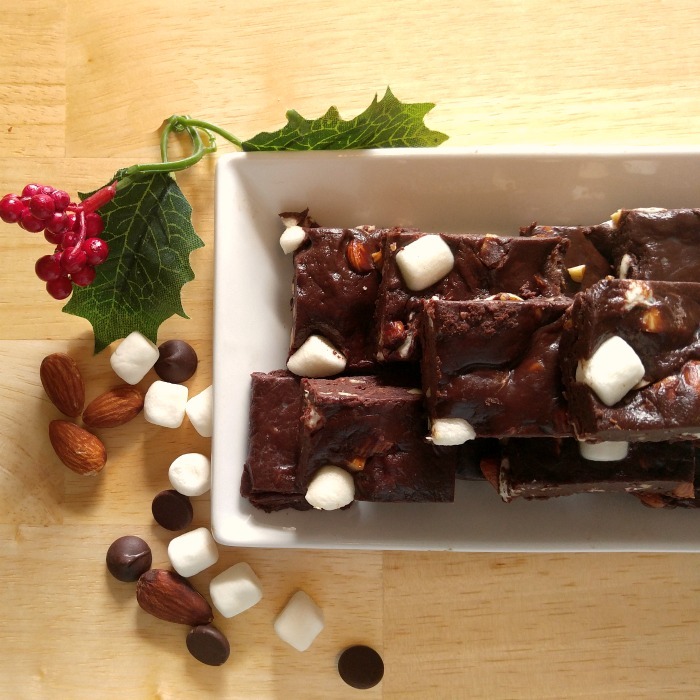 This dark chocolate fudge has mini marshmallows in it for a sweet creamy taste and texture. Get the recipe here. 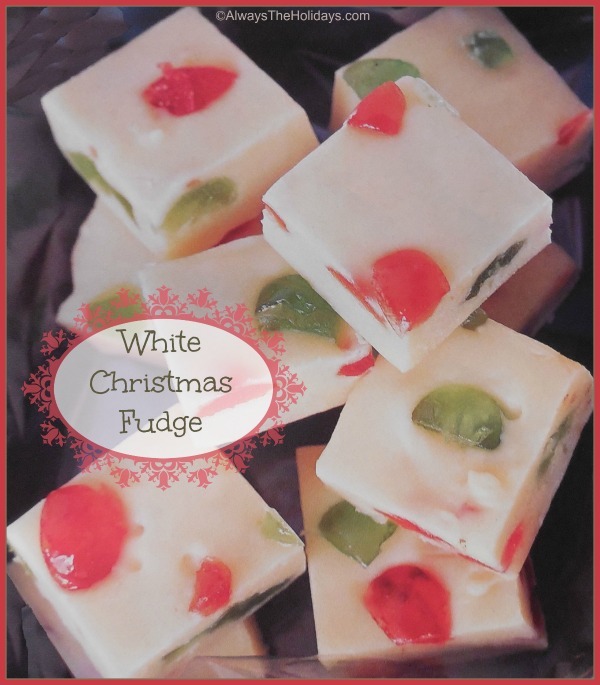 White Chocolate Mosaic Christmas Fudge. This mosaic Christmas fudge is a favorite in our house. The red and green cherries add a festive touch and blend in nicely with the sweet white chocolate. Get the recipe here. 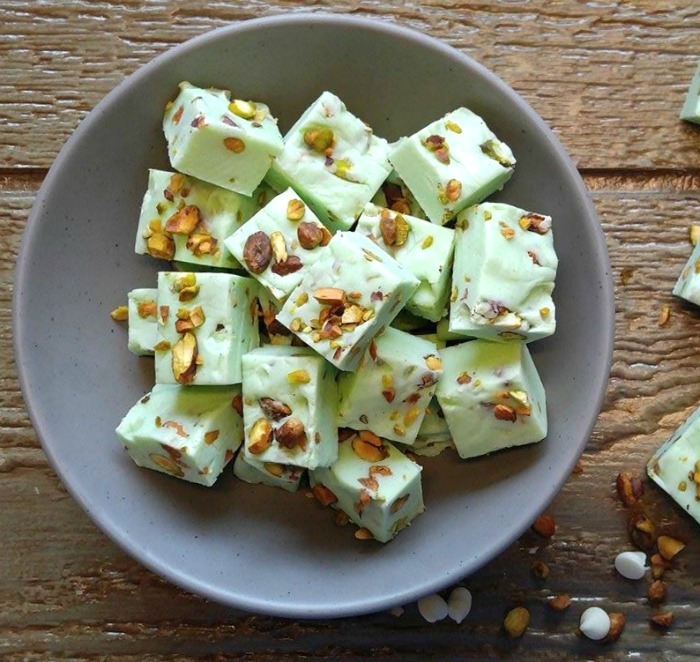 Easy Pistachio Fudge. Fat Free sugar free pudding mix is the secret ingredient for this fool proof easy pistachio fudge. It sets perfectly every time! See how to make it here. 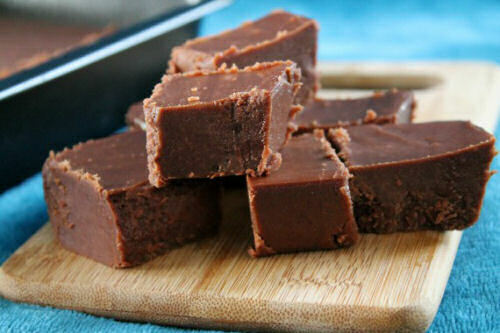 2 ingredient Fudge. If your pantry is bare and you don’t have the normal fudge making ingredients, don’t despair. 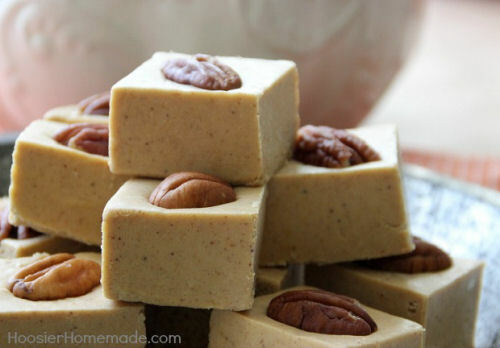 You can still make some delicious fudge with just two ingredients. Find out how at Penny Pincher Jenny. 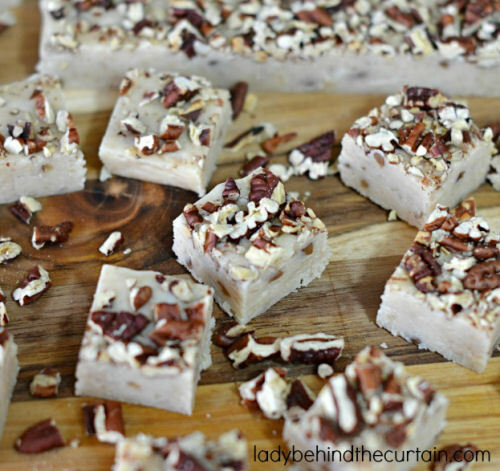 Coconut Pecan Fudge. Who doesn’t like a 5 minute fudge recipe? With the holidays being so frantic, being able to put together this tasty coconut pecan fudge in just minutes is a perfect choice. See the recipe at Lady Behind the Curtain. 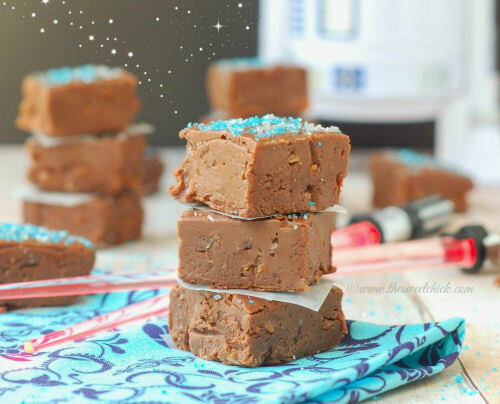 Vegan Peanut Butter Fudge. Making fudge is a challenge for vegans because of dairy restrictions. My daughter Jess is a vegan and I tinkered with my fudge recipe last year to come up with a very tasty Vegan peanut butter fudge for her. She loved it and my husband, who normally doesn’t like fudge, did too. It’s not too sweet but is delicious. See the recipe here. Mint Chocolate Fudge. One of my favorite things to get in my Christmas stocking is Andes mints. If I find them this year, I’ll be making some of this Andes Mint Chocolate chip fudge from Sally’s Baking Addiction. You can find her recipe here. Dark Chocolate Peanut butter Fudge. In case you didn’t notice, for my personal recipes, there is a common ingredient! Peanut butter. PB is one of my favorite. In fact, I think it should be a food group!. 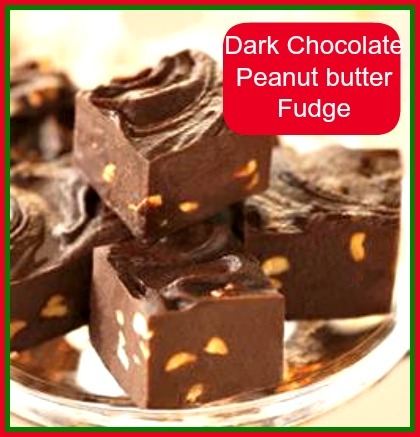 See my dark chocolate peanut butter fudge recipe here. 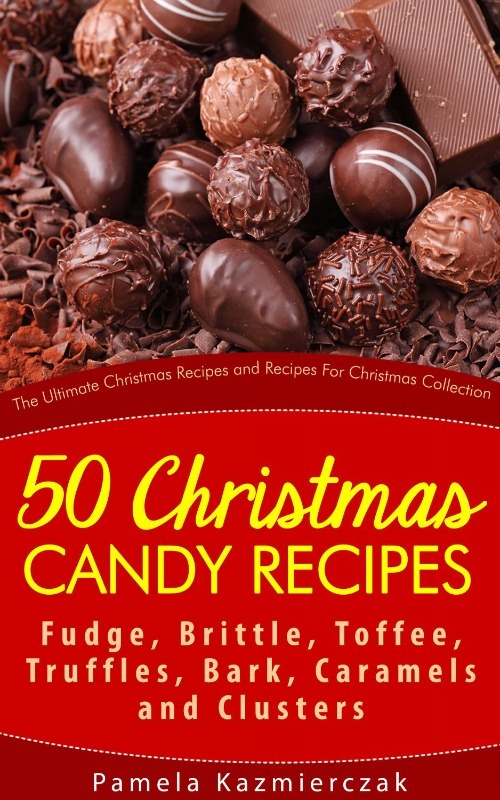 If these 23 fudge recipes are not enough to tempt your sweet tooth, our Affiliate Amazon has a great Kindle version of the book 50 Christmas Candy Recipes. It covers everything from fudge to truffles and peanut brittle. See more here. 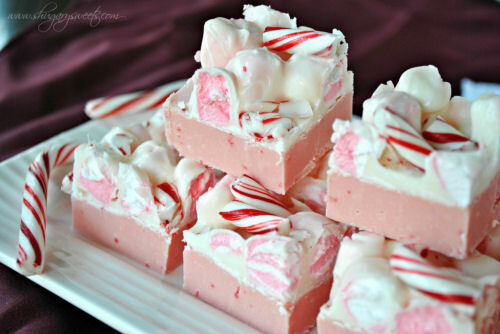 White Chocolate Peppermint Fudge. I love the way the sprinkles on this white chocolate peppermint fudge make the platter look so festive. Get the recipe at Loves Bakes Good Cakes. Pumpkin Pie Fudge. Perfect for either Thanksgiving or Christmas time, this pumpkin pie fudge recipe from Hoosier Homemade will have your guests asking for more. Get the recipe here. Bailey’s Irish Cream & Coffee Fudge. No Christmas is complete without a shot or two of Bailey’s Irish Cream. And when the Irish cream is an ingredient of fudge, even better! 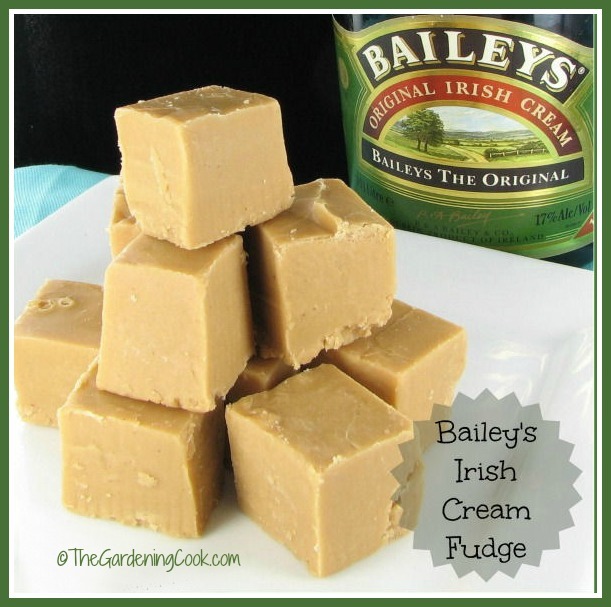 Get the recipe for Bailey’s Irish cream and Coffee fudge here. Bourbon Bacon Chocolate Fudge. Everything goes better with bacon, or so they say! This bourbon bacon chocolate fudge from The Sweet Chic is a perfect choice for those who love to cook with alcohol. 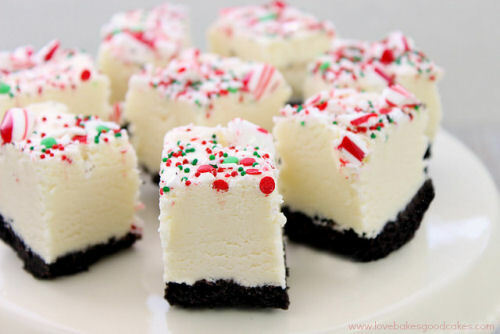 Peppermint Crunch Fudge. 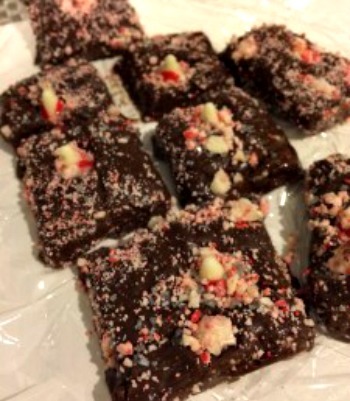 This peppermint fudge from Shugary sweets will have the kids dreaming of all things Christmas! It is a delicious combination of Andes peppermint crunch baking chips, white chocolate and real crushed candy canes. Get the recipe. Classic Chocolate Fudge. This chocolate fudge looks very crumbly and delicious. Don’t think it will last long on the holiday table! Get this classic chocolate fudge recipe at Awesome on 20. 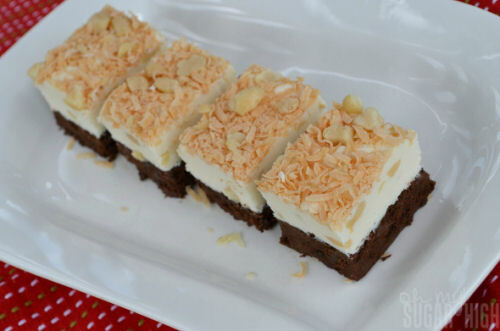 Coconut Macadamia Nut Fudge. Christmas is the one time of the year when I buy Macadamia nuts. Combining them with coconut and chocolate is the perfect choice! Get the recipe on Oh My Sugar High. Root Beer Float Fudge. 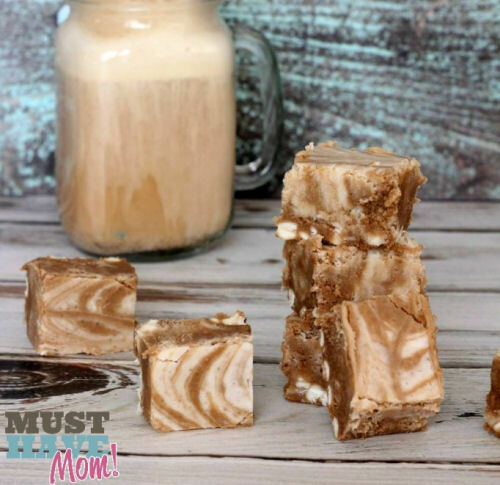 If you like root beer floats, you will love this fudge from Must Have Mom. Old Fashioned Maple Fudge. This recipe reminds me a bit of the Vermont maple syrup candy. Get the recipe at My World Simplified. Irish Cream Pistachio Fudge. Another fudge that uses alcohol. I don’t know what it is about spirits, but adding it to a fudge recipe makes for a great taste. 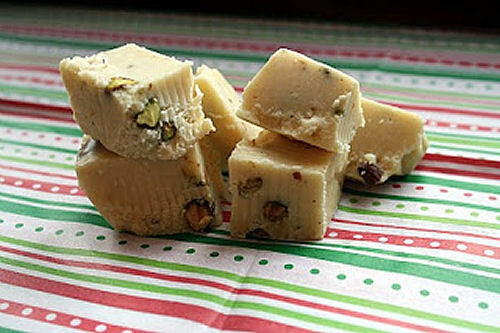 Get the Irish cream pistachio fudge from I Was Born to Cook. S’mores Chocolate Fudge. Feel like a camping trip treat at the holidays? 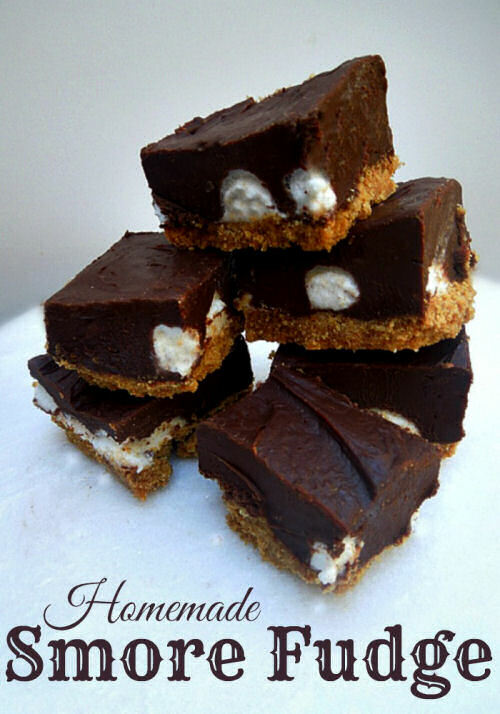 Try this S’mores fudge from Miss Information Blog. Chocolate peppermint fudge. This festive chocolate peppermint fudge completes the round up. Get the recipe from Take a Bite out of Boca. All of these recipes look delicious! Thanks for including mine in your roundup. Have a blessed day!